Aqua, Glycerin (vegetable glycerin)**, Apitoxin (bee venom)**, Mel (manuka honey)**, Cocos nucifera (coconut) oil**, Isoamyl laurate, Galactoarabinan (larch tree extract), Xanthan gum, Caprylyl/Capryl glycosides, Sodium cocoyl glutamate, Caprylate, Citric acid, Triethyl citrate, Glyceryl caprylate, Benzoic acid, Sodium levulinate, Sodium anisate, Sodium phytate, Parfum*. *From natural essential oils: Geraniol, Limonene. **Certified organic. Not suitable for those with bee-related allergies. 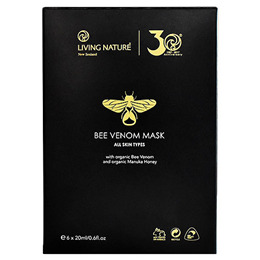 Below are reviews of Living Nature Bee Venom Mask - 6 Sachets - Best before date is 30th June 2019 by bodykind customers. If you have tried this product we'd love to hear what you think so please leave a review. Living Nature’s organic Bee Venom Mask combines bee venom with the natural botanicals of organic Manuka Honey and certified organic coconut oil.